Check with us before ordering. Our supplier's marble making machine is in need of a tune up and other adjustments so we may be out of stock. 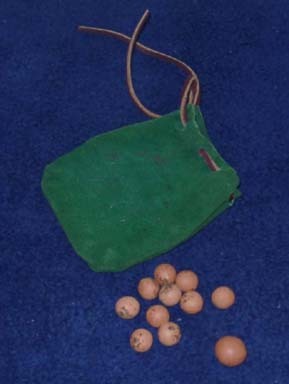 Marbles were used in a number of games. For a complete discussion, try to get a copy of The American Boy's Book of Sports and Games which can be obtained from Amazon Books. The most well known of games of marbles to modern players is "ringtaw" which involves scratching a circle in the dirt and each player putting a certain number of marbles in the center. The players then take turns trying to use their shooter to knock the marbles out of the ring. And in the nineteenth century, marbles were played for "keeps," i.e, each player keeps any marbles they win. The cost of a set of marbles will probably be $6.60 when they become available.